← Do You Have a Famous New Hampshire Name? what we know about the personal life (and death) of George Washington. Yet few people recognize his name. Tobias personally knew four Presidents of the United States. He was cousin to John Langdon, who was twice Governor of New Hampshire (post American Revolution). He was distantly related, by marriage, to both his long-time employer and friend, George Washington (through his second wife), and also to Martha Washington (through his third wife). In 1786, on the recommendation of General Benjamin Lincoln, an overseer at Harvard College, and a mutual friend of both Tobias and George Washington, Tobias moved to Virginia to become both secretary to Washington, and tutor to Martha Washington’s two grandchildren. At that time Tobias was a twenty-four year-old Harvard graduate who had studied in Europe. He continued to serve Washington as his personal confidante throughout his Presidency, and often lived with him as a member of his family. Tobias Lear was with Washington at his death, and recorded his last moments for posterity. Washington spoke his last words (regarding funeral arrangements) to him. 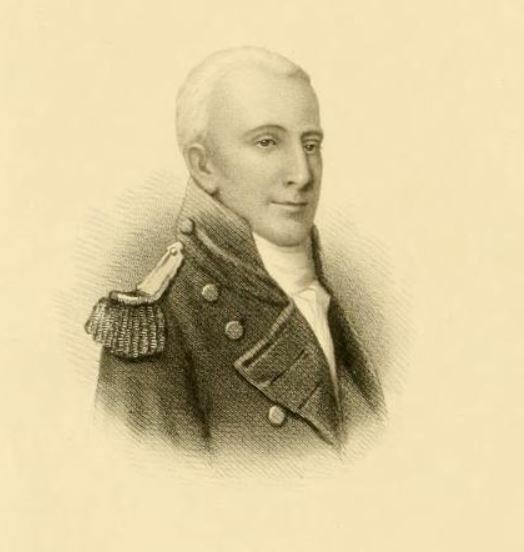 After Washington’s death, Tobias Lear was U.S. Consul to Santo Domingo (1802), and Consul General at Algiers (1804). He negotiated the treaty with he Barbary powers that released the prisoners captured after the loss of the “Philadelphia”. He was also a director of the Potomac Company, of which George Washington was the first president, that built a canal, making 220 miles of the Potomac between the Savage River and Washington, D.C. navigable for trade. He wrote the first history of Washington DC, called “Territory of Columbia and City of Washington.” In addition he wrote “Observations on the River Potomack, the country adjacent and the City of Washington,” on the history and building of the city of Washington, D.C. This book was printed by Loudon & Brower, New York, 1794. According to one source, “One morning in the fall of 1816, while residing in the mansion, he was found in the summerhouse of the grounds of his home in Georgetown, in the rear of the house, with his brains blown out and a pistol in his grasp.” He left no suicide note, nor will. There are several homes, still in existence, where Tobias Lear resided. The first, The Tobias Lear House, at 51 Hunking Street in Portsmouth, New Hampshire, has been restored, and is open to the public. This plain Georgian home, marked with a bronze tablet, is the site of Tobias Lear’s birth in 1762. Washington visited it in 1798, when Lear was his private secretary at Mount Vernon. The Wellington House at River Farm, in Washington, D.C. owned by George Washington, and leased for his lifetime, free of charge to Tobias Lear (in his will). The American Horticultural Society purchased the farm, renamed it River Farm. Today it serves as the headquarters of that society. The Robert Morris House, on Market Street near 6th Street in Philadelphia PA, where Tobias Lear shared the quarters of George Washington and family. This house no longer exists, but it was the “White House” from 1790 to 1800 when Philadelphia was the capital of the United States. It stood a block north of Independence Hall. The entrance to the new Liberty Bell Center is at the site where Washington built slave quarters to house some of the nine enslaved Africans he brought to Philadelphia. The Wirt House, in Washington DC, stood in the block of 1700-1800 G. Street, on the south side, between 17th and 18th, and this where he committed suicide. I don’t know if this house still exists. 1776 G. Street, which is in the general vicinity, is a 260,000-square-foot, eight-story office building that was built in 1979 and is owned by Hines, an international real estate firm, and contains several tenants including a hair stylist, the Abu Dhabi International Bank, McReynold’s Liquors, etc. Other buildings within the block include Wall Street Deli [1800 G Street], Parking Management Inc , Hot Off the Grill , Exchanged Limited  and Compton Jewelers . Hugh Lear was born abt 1600 in Staverton, Devon, England and died there. He married about 1627 in Staverton England to Joanna –. She b. abt 1600 in Staverton England. (1) John Lear, cordwainer, b. abt 1672 in Portsmouth NH; had gift of land from grandmother Elizabeth Savage in 1702. In 1708 he deeded to Hugh Banfield, reciting that his grandmother deeded marsh to his three sisters, one Lear, two Wells. The same year he deeded land to his cousin, Tobias. His wife Hannah was received into covenant in the South Church in January, and he in August 1728. Both deeded to sons Benjamin and Samuel in 1742, and he to Samuel in 1746. A Mrs. Lear (probably she) died in Portsmouth in 1775 in 105th year. Children: (a) Benjamin, b. 1720, baptized as adult 28 Jan 1728, the hermit of Sagamore Creek; (b) Samuel, b. abt 1706 in Portsmouth NH; farmer m 22 Jan 1730-31 Mary Lucy. Had children Samuel, Alexander, Mary, Deborah, and one unknown name; (c) Hannah bap adult 28 Jan 1728 (d) Elizabeth recd into covt South Church 26 June 1726, was of Durham NH; single woman she sued Abraham Bartlett in 1733 for pay as housekeeper. (e) John, bapt 25 Aug 1728. (2) Susannah Lear, m. 1st Philip Lambeth, 2d James Abbott, 3d Saml. Adams. In June 1713 Jas. and Susannah Abbott, Henry and Elizabeth (Wells) Donnell and Mary Wells deeded marsh given them by their gr. mo. Savage in 1702. She had two daughters, Mary and Martha by her first husband, Philip Lambeth. Tobias Lear, son of Hugh and Joanna Lear, was b 18 Jan 1629 in Portsmouth NH, and d. bef 5 Dec 1681 in Portsmouth NH. He was a mariner. He had a brother Hugh Lear, who was a mariner of Sandy Beach (Portsmouth) NH. He married 11 Apr 1667 in Portsmouth NH to Elizabeth (Sherburne) Langdon, daughter of Henry & Rebecca (Gibbons) Sherburne, and widow of Tobias Langdon whom she married 10 June 1656. [Note: by her first husband she had one son, Tobias Langdon Jr. who was grandfather of Gov. John Langdon of NH]. She was born 4 Aug 1638, twin sister to Samuel, and died 10 June 1656 in Portsmouth NH. Tobias Lear’s will, witnessed 5 Dec 1681 by brother Hugh mentions wife Elizabeth, father-in-law Henry Sherburne and 3 children. She was taxed as a widow in Aug 1684. She married 3rd Hon. Richard Martyn. She d. bef Jan 1692-93. In 1660 he had a lawsuit with John Odiorne over fishing accounts. She married 3rd, Hon. Richard Martyn, as his fourth wife. 1. Elizabeth Lear, b. 11 Feb 1669 in Portsmouth NH; d after 1730 in Portsmouth NH; she married Nathaniel Melcher. [several sources state she m. William Fernald] In 1730 her brother Tobias quitclaimed to her, widow, house and 20 acres where she was living, on south side of Sagamore Creek over against Nathaniel Lang’s and she receipted for her full portion from her father’s estate. Children [MELCHER]: Edward, Nathaniel, Elizabeth, and John. 1. Tobias Langdon, b. 1660; m. Mary Hubbard, had issue. Tobias Lear, son of Tobias & Elizabeth (Sherburne) Lear, was b. abt 1676 in Portsmouth NH and died before 3 March 1755 in Portsmouth NH. Title, yeoman. In a document dated 26 May 1694, Tobias Lear, late of Portsmouth NH, now of Hampton NH, chose his brother-in-law [half brother] Tobias Langdon guardian. Under Hon. Richard Martyn’s will 27 Jan 1692-93 he was given a house and barn near Sagamore Creek which was his mothers. He served on the jury in 1695. He was constable of New Castle in 1699. He married 1) Jan 1702 to Sarah Curtis, daughter of Joseph & Sarah (Foxwell) Curtis. She b. 10 Aug 1681 in Kittery, York Co ME and d. 29 Nov 1703 in Portsmouth NH. He married 2d) in Rowley MA 10 July 1704 Hannah Smith, dau of Samuel & Mary (Elithorpe) Smith. She was born abt 1682 in Rowley MA and d. 14 Apr 1714 in Portsmouth NH. He married 3rd) 14 Apr 1714 Elizabeth Walker, dau of Joseph & Hannah (Philbrick) Walker. She was b. abt 1680 in New Castle NH and d. abt 1767 in Portsmouth NH. He died by 3 March 1755 as inventory of his estate was taken, with John Griffith, administrator. The will was settled in 1756, the widow’s dower and 2/3 to grandson Tobias Lear. Children recorded in New Castle NH. 2. Nathaniel Lear, b. 25 July 1712 in New Castle NH; m. 1739/40 Temperance Peverly. She was baptized 26 May 1717, daughter of John & Deliverance (Lang) Peverly of Portsmouth NH. He sued his father’s estate for three year’s service 1733-4-5 and cutting and hauling wood 15 years go 1754. He was living in 1768. 3. Elizabeth Lear, b. 10 May 1716 in New Castle NH, d. 17 Aug 1735; m. 11 July 1734 to Josiah Webster. He b. 1706 in Hampton NH. She d. 17 Aug 1735 with infant daughter. 4. Mary Lear, b. 24 Nov 1717 in New Castle NH, and died bef June 1767 in Portsmouth NH. She married 12 Dec 1734 to John Banfield, son of Hugh Banfield. She d. before June 1767; had issue. married 1st) 1745 to Mary Nelson, daughter of Joseph Nelson. He married 2d) 12 Jan 1758 to Mary Cowell, daughter of Benjamin Cowell. He and his 2nd wife were living in 1764. He was living in 1767. Had children by both wives, including Elizabeth b. 8 Sep 1751, and Joseph born 20 Aug 1749. Capt. Tobias Lear, son of Tobias & Hannah (Smith) Lear was b. 29 March 1706 in New Castle NH and d. bef 27 Nov 1751 in Portsmouth NH. He was a mariner. He married 13 Dec 1733 in Portsmouth NH to Elizabeth Hall [Hale], daughter of Josiah & Mary (Woodbury) Hale. She was born about 1713 in Exeter, Rockingham Co NH and d. 21 July 1774 in Portsmouth NH. He died by 27 Nov 1751 when administration was granted to his widow of his estate. She d. 21 July 1774, aged 58 (Point of Graves). 3. Elizabeth Lear, poss. bapt 26 Aug 1739; she m. Nathaniel Sherburne, son of John & Eleanor (Mendum) Sherburne. He was probably the Nathaniel Sherburn sent to Halifax with a flag of truce to exchange prisoners 24 June 1778 (NH Hist. Colls vol 7, p 158). Captain Tobias Lear, son of Tobias & Elizabeth (Hall) Lear, b. 8 Aug 1736 in Portsmouth NH, and d. 6 Nov 1781 in Portsmouth NH. He married 29 Dec 1757 in Portsmouth NH to Mary Stilson, daughter of James & Mary (True) Stilson. She was b. bef 27 May 1739 in Portsmouth NH, and d. 21 May 1828 in Portsmouth NH. After the death of her son Tobias’ wife, she lived with him to care for his child and step children. Dandridge Henley, dau of Leonard & Elizabeth (Dandrige) Henley. She b. 17 Nov 1779 in James City Co. VA. She d. in 1856. Fanny was the eldest child of Martha Washington’s sister Elizabeth and her second husband, Leonard Henley, of James City County. Besides his son, Tobias Lear was step-father to George Fayette Washington and Charles Augustine Washington, son of his 2nd wife Fanny. After Fanny’s death, his mother Mary came to care for the children. His step-daughter Anna Maria Washington left to live with her uncle Burwell Bassett Jr. at Eltham. 1. +Benjamin Lincoln Lear, born 11 March 1791, Philadelphia PA.
Benjamin Lincoln Lear, son of Tobias & Polly (Long) Lear, was born 11 March 1791/92 in Philadelphia PA, at George Washington’s home there. He died 1 October 1832, age 40 years during a cholera epidemic. George Washington was his godfather. He was named after Benjamin Lincoln, who had recommended Tobias Lear for the position of tutor/secretary to the Washington’s. He was raised in Portsmouth NH by his grandmother. Later he was a prominent lawyer in Washington, D.C. He, like his father, is buried in the historic Congressional cemetery, his grave having one of two private Latrobe-designed gravestones. Benjamin married twice . His 1st wife died in childbirth. He married 2nd) 9 Aug 1831 in Washington DC to Louisa Sophia Bomford, dau of George and Louisa (Catton) Bomford. She b. 3 May 1813 in Albany NY and d. 19 Apr 1864 in Newport RI. After her husband’s death, she married 2nd) on 8 Sep 1835 Richard C. Derby in Washington DC. Louisa gave Benjamin Lear a daughter (who he never saw, dying of cholera). She also had a child by Richard Derby, a son, Richard Caton Derby who was b. April 1847 in Washington DC and d. 26 Feb 1923 in Brookline MA. [He married 14 March 1876 in Newport RI to Mary Byrd Tucker]. SEE more info on the Bomford genealogy. Louisa Lincoln Lear, dau of Benjamin L. & Louisa S. (Bomford) Lear, was b. 1 May 1831 in the District of Columbia and died 30 Dec 1912 in Philadelphia PA, when her age was recorded as 79. She married about 1856 in Florence, Italy to James Wilson Eyre. He was born abt 1822 in PA, the son of a ship builder, Manuel Eyre and his wife Ann Connelly. He was a Philadelphia attorney, who was United States Consul in Venice during the period of Italian unification. He died 4 Sep 1901. He had a law practice of Hughes & Eyre 927 Chestnut St. Phila in 1890. She edited the book: “Letters and Recollections of George Washington,” which included 91 letters from Washington to her grandfather Tobias Lear, written between 1790 and 1999. About 1869 they retired to Newport, Rhode Island where they lived for 19 years. They are both buried in the Woodlands in Philadelphia, beside four of their five children. 1. Lincoln Eyre, b abt 1857; a lawyer living with his parents in Newport RI in 1880; he removed to Philadelphia. He married before 1892 to Marianna H Benney. They had a child, Virginia Eyre, b. 20 Aug 1892 in Ocean City, Ocean Co., NJ. 3. +Manning Coe Eyre, b. abt 1861; Italy; in 1875 living with father and family in Newport, RI. 5. Louisa Lear Eyre, b. 1872, died 1953; in 1910 living with her mother in Philadelphia; a sculptor who studied with Augustus Saint-Gaudens; never married. Wilson Eyre, Jr., son of James W. & Louisa L. (Lear) Eyre, b 30 Oct 1858 in Florence, Italy, and d. 23 Oct 1944, buried Philadephia. He was an architect. After briefly attending M.I.T. and working in the office of James Peacock Sims for several years, Eyre took over the latter’s practice following Sims’ premature death in 1882. He soon achieved national repute for his Shingle-style houses. He was one of several founders of the T Square Club of Philadelphia in 1883. He designed the Freer House at 71 East Ferry Ave in Detroit, Michigan, later the Merrill-Palmer School for the study of human development and family life. [Eyre’s only Detroit work]. Links to more information: #1 Link| #2 Link| #3 Link| Photograph. Manning Coe Eyre, son of James W. & Louisa L. (Lear) Eyre, b. abt 1861 in Italy; He married twice, the 2nd time about 1905 to Rhoda R. –. She b. 17 July 1878 on Fishkill on Hudson NY. In 1910 living in a boarding house in Manhattan, New York. He died by 1930, as Rhoda is found a widow in the 1930 census in Manhattan NY, no children in household. Richard Derby Eyre, son of James W. & Louisa L. (Lear) Eyre, b. 26 Feb 1869 in Italy; immigrated to the United States in 1889 with his parents. He was a successful patent attorney. He married 1st) 1893 in Cambria Co. PA to Elizabeth Krieger/Kreiger. She was b. 21 March 1865 in Johnstown PA, daughter of Christian & Elizabeth Kreiger. He died in 1955. She died in 1938. Elizabeth suffered from depression, spending extended periods of time in a Summit, New Jersey sanitarium. 2. Louisa Lear Eyre, b. 10 Aug 1897 in Johnston PA, and died Oct 1966 in Greenwich CT. She married Stephen Upson Norton. He was b. 5 July 1896 in Waterbury CT. son of Andrew & Ida E. Norton of Waterbury, New Haven Co CT. In 1918 when he registered for the WWI draft, he indicated his father was born Plymouth CT, and his next of kin was his mother, Ida Norton. Louisa entered M.I.T. in 1920, receiving a Ph.D. in Physics in 1924. In 1923 the Cambridge MA directory shows her single, as an instructor at MIT. In 1931 she was married and living in Goshen CT with husband, when he is listed as “sec-treas-mgr of Torrington.” Either widowed or divorced by 1957, she was living in Greenwich CT, and continued to do so until her death. Elizabeth Eyre, daughter of Richard D. & Elizabeth (Krieger) Eyre, was born 20 March 1894 in Johnstown, Cambria Co. PA. According to her online bio, she attended Miss Hazen’s School in Pelham Manor, Westchester County, New York and enrolled in classes at the Art Students League in 1912 and during 1914-15. She exhibited two paintings, “L’Arlesienne,” and “Allegro,” in the first annual exhibition of the Society of Independent Artists in 1917. She married 9 Oct 1918 in New York to Pierre Combret de Lanux. He b. 1887 and d. 1955, a writer, secretary, and member of the French High Commission to the United States. She was sometimes referred to as Eyre de Lanux. Elizabeth continued to study painting [see bio for details] and producing artwork. They resided in the United States from 1920-1922. She died August 1966 at the age of 102. She began work on a biography of Tobias Lear, and those documents were given to the Smithsonian in 1996 by her daughter Anne. [Note several times I have seen Tobias referred to as “a distant relation of the Eyre family.” In fact, he would be Elizabeth’s great-great grandfather [a direct ancestor]. Pierre was a friend of Antoine de Saint-Exupery. 1. Anne-Francois “Bikou” de Lanux, b. 19 December 1925 in France; m. Paul L. Strong, an educator and former Tuskegee Airman, as his 2nd wife. He had married 1st) Evelyn Richardson Strong. Paul Strong was born on 16 July 1916 in McAlester OK to William and Ruby Strong. He died 9 February 2014. Children: a daughter, Nona C. Strong; and three stepsons, Nick Eyre, Paul Eyre and Marc Smalls. Paul R. Eyre, 3408 Kahawalu Dr., Honolulu, Hawaii. Paul married Melinda L. –. 4. The first forty years of Washington society by Margaret Bayard Smith, New York, C.
This entry was posted in Genealogy, Military of New Hampshire, New Hampshire Men and tagged George Washington, Lear, New Hampshire, NH, patriot, Portsmouth, secretary, Tobias, Tobias Lear. Bookmark the permalink.